Ignoring a broken or damaged windshield on your boat is very dangerous. A windshield provides your visibility of what’s ahead and protection from wind, bugs and water. Anchor Marine Repair’s Expert Windshield Repair Technicians complete the highest quality repairs in the Minneapolis, MN area. We can repair or replace flat or curved boat windshields, no matter what they are made of or how they were damaged. 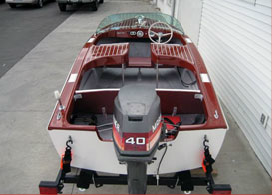 Our boat repair mechanics specialize in professional grade boat repair services and restorations. It is important that your damaged windshield be taken care of by an experienced boat windshield repair technician. Every component of the boat’s windshield is important, including the brackets, frame and edging. All play a role in the performance and safety and must be installed by an expert windshield repair technician who specializes in boats. Windshield Repair is generally appropriate when the damage is minimal and the frame is intact. A severely damaged windshield requires a complete windshield replacement. Our windshield repair technicians can also repair damages to other glass on your boat, such as the center or side console. We can repair or replace tinted, clear, custom made, plexiglass and tempered glass. The team at Anchor Marine Repair loves boats and everything about them. We have a combined 45 years of experience and a state-of-the-art facility where your boat will be treated the way You Want it to be treated. We specialize in boats and have the hands-on experience to quickly identify problems and find solutions. Our professional team is comprised of Boat Repair Mechanics, Windshield Repair Technicians and Boat Painting Experts – all here to restore your prized boat back to factory condition or customized to your specifications. We offer pick up and delivery services within 250 miles of Minneapolis, MN and have very competitive prices. I need driver side front windshield on a 1996 Glastroon 22.5.